New design: Tehelné pole witnessing its last days? 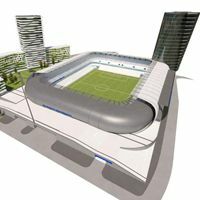 After seven years since the foundation of new Slovak national stadium project finally there is a planning permission. If it goes into force at the end of June, demolition of dilapidating Tehelné pole is just days away. Check out the latest vision for Bratislava. It’s been 4 years since Tehelné pole was last used for football. Slovakia’s largest existing stadium is falling into despair and demolition seems to be the only reasonable option. This is also the view of Národný futbalový štadión a.s., a private consortium established back in 2006 with the aim of building a new national arena for Slovakia. Its shareholders were football clubs Inter, Artmedia Petrżalka and Slovan, of which only Slovan still exists today. This club and Ivan Kmotrik, multimillionaire behind it (also accused of destroying Petrżalka) are now expected to take over at Tehelné pole. They have something that wasn’t there before – planning permission given in May for the redevelopment project, consisting of the new 20,500-seat stadium, hotel tower, 315 apartments, shopping centre and underground parking spaces. The stadium itself is thought to cost some €40 million, being built privately in exchange for the commercial parts. Over the years there were several visions already, but this one by Cube Design went further than any other and if no appeal is filed for the permit until late June, it will go into force, allowing for Tehelné pole demolition to begin this summer and the new complex to be delivered in 2016.